As I blissfully slept in on Saturday morning with the very rare occasion of not having an alarm, I couldn't believe that I was going to run the iconic Carlsbad 5000 the next day. 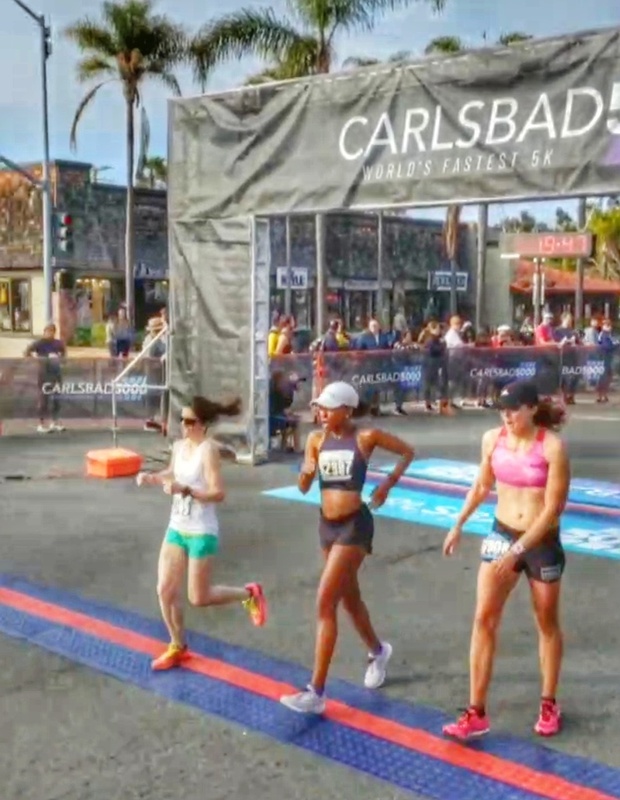 As a Southern California runner, April is the beginning of all the springtime race madness and Carlsbad is definitely at the top of the list. When I watched the coverage and read the articles last year, I knew I wanted to be part of the action this time. 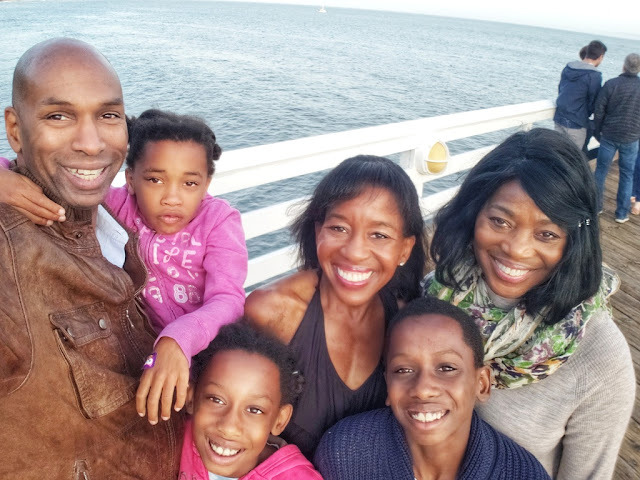 We had a relaxing day with a lot of family time and I was able to settle into bed by 8 PM. I fell asleep closer to 9 PM and set my alarm for 3:50 AM. Jerold and I were on the road early (I had a banana and english muffin for breakfast) and arrived in Carlsbad by 6:45 AM. It was such an easy one hour and forty minute drive, I fell asleep during part of it (grateful for Jerold driving), and we were able to see a stunning sunrise. Carlsbad is a beautiful little beach town and the race made sure everything was laid out so easily for the runners. 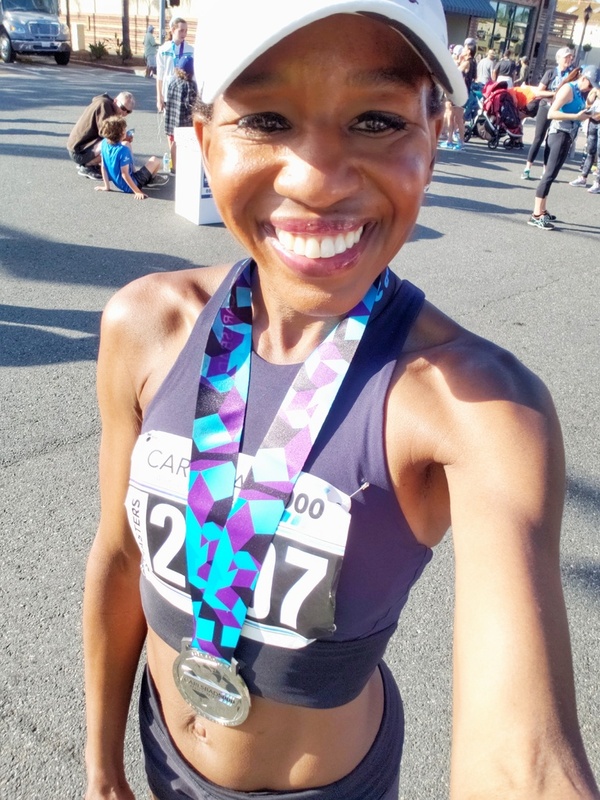 I was able to jog and grab my bib (Ashley, one of the race executives recognized me and we were able to chat for a moment - everyone was so friendly! ), go to the bathroom and start my warm up in no time. I did a dynamic warm up and then ran an easy two miles with the last minute pretty quick to get my legs going. Then it was time to get to the starting line. It was pretty cool to start with so many amazing masters women - I loved having a entire race just for us and then we were off. I wanted to not sprint out, but stay controlled. First mile 6:06. This first mile split was perfect and right where I needed to be, I just needed to hold that pace, but it wasn't happening today. I felt low on energy, my legs didn't have any pep and running fast felt hard. On days like that, you just gotta keep pushing and fight for things to turn around. Second mile 6:20. I kept playing mental games with myself that I only had one mile left to push - one mile! One mile is nothing and yet sometimes it feels like forever. 6:33. Really bummed about this, but I just didn't have it yesterday. I was competing a little back and forth with another woman and I remembered that once you pass someone, pass them with confidence - blow by them and never think about it again. They won't answer and you never look back. Well, I did that - I passed her strong and at the very end she caught me and in that moment, I did something that I never do - I didn't fight for it. I felt so mad at myself for not having the best race, that I didn't fight for that spot. When my watch beeped at the three mile mark at 19 minutes, instead of giving absolutely everything, I let myself wallow in the fact that I had less than ideal race. 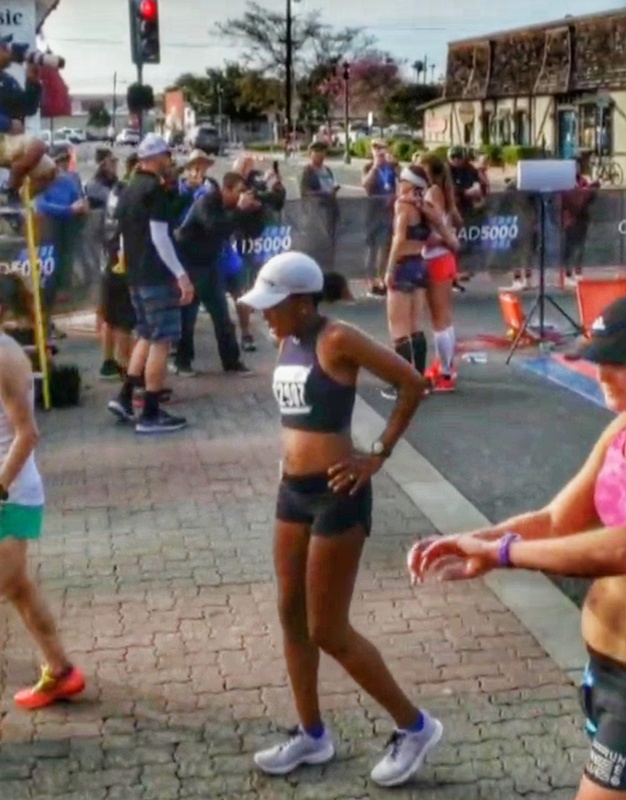 Coach's plan was 18:40 - 19:20 and based on the workouts I've thrown down the last few months, I know I can do that + he never gives me paces out of my reach. Anyway, I learned a ton, it's back to training and I can't wait to tackle this distance again! The great thing about 5ks is that the recovery is fast and you can always do another one. I've done many races in Carlsbad and it never disappoints. You really feel like you are on vacation here - gorgeous weather, quaint restaurants and beautiful beaches. 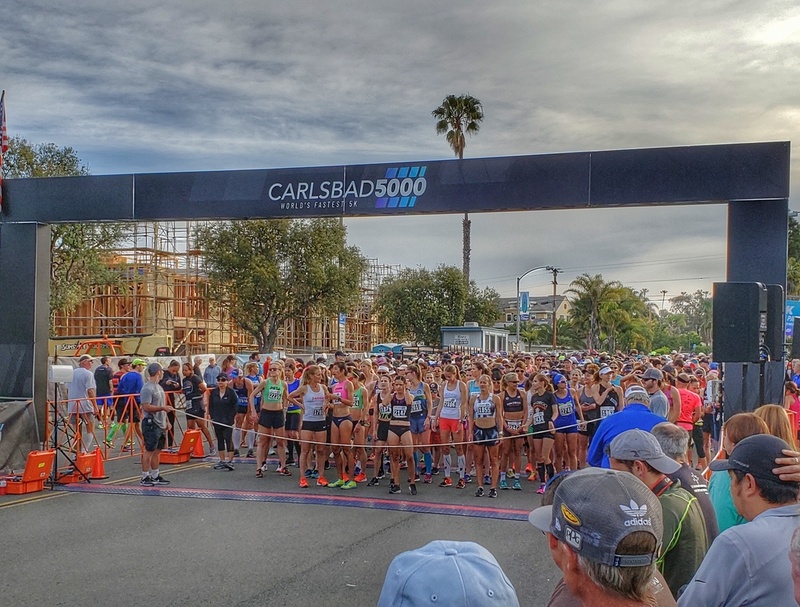 Carlsbad 5000 took full advantage of the location and put everything in the center of town, which made it so easy to access and comfortable for the runners. The race course is pretty flat and lined with spectators and ends with a down hill. Be ready to fight and gain spots in the downhill finish. The women's masters race started at 7:55 AM and I didn't even need my sunglasses. Perfect, cool morning weather. Everyone that worked at the event that I met was super professional and friendly - from getting your bib, to picking up your race shirt. Again, my race started early, but I immediately got into a porta potty - no lines for anything, easy to find everything. 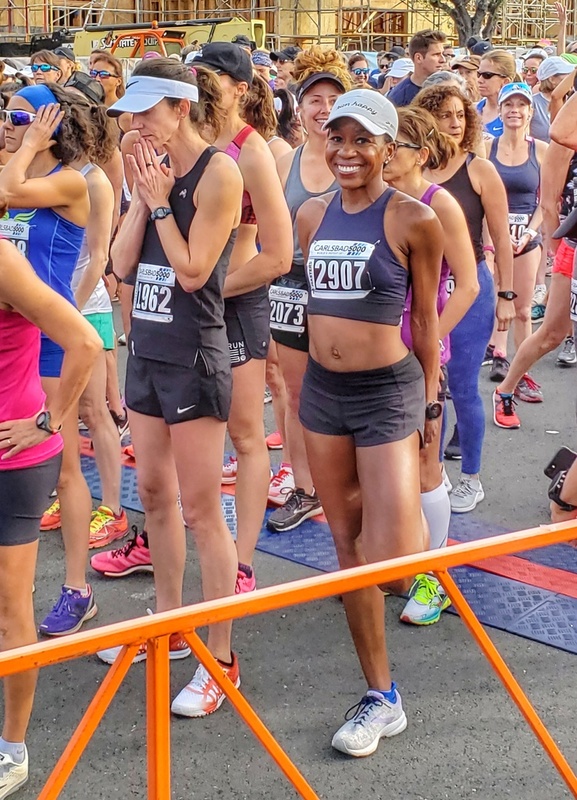 This is a great race to test yourself among some of the best runners around. If you can, stay all day and see the elite runners compete at noon. We had to get home very quickly for our kids, but it turned out to be an epic showdown! 7. Food, Drink and of course - music! It's only a 5k and yet they provided bananas, full bottles of Gatorade, water and other food. Music was playing everywhere and runners were in a happy mood. A perfect way to start Sunday. 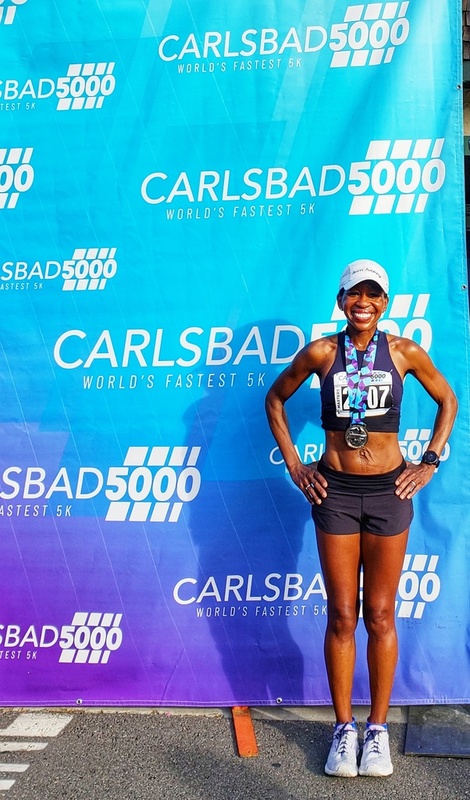 You can easily make the Carlsbad 5000 a racecation, especially since it is right around spring break for many people. Stay in Carlsbad or head into the heart of San Diego for a great vacation! We don't let races define us. Learn, grow, move forward. I'm back to training this week and onward we go. April Is Here. I'm Running The Miles. Working on Speed. Keeping The Faith. 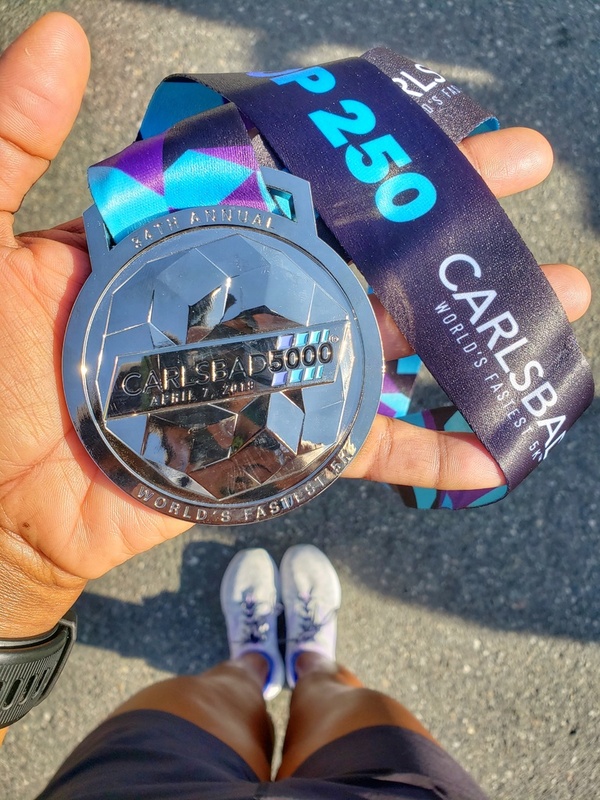 It's hard to believe that I ran just one marathon in 2018 (although the plan was two) and yet here we are in the second quarter of 2019 and I already have a marathon under my belt. It feels really good to start the year off that way and I'm looking forward to how much I can grow in the sport this year. 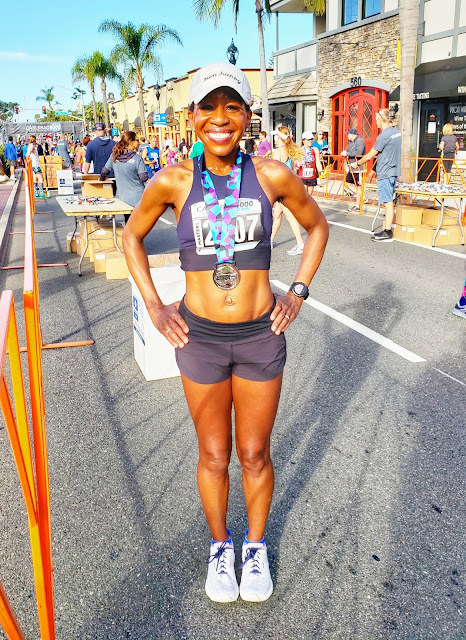 Becoming a good marathoner takes time - training cycle after training cycle, year after year to build the miles in your legs and the strength in your body. Marathoners have to pay their dues and this brings a sense of satisfaction to my training. I love the process of waking up in the morning and thinking about what my run will bring me. Even on the not so fun runs - Monday was more of a recovery slog -especially the first half and then the blood begins to flow and the legs loosen up. I definitely was ready to bring it to an end, and yet I'm always happy that I showed up. I'm in a good rhythm of carefully logging miles and trying hard to take care of my body. 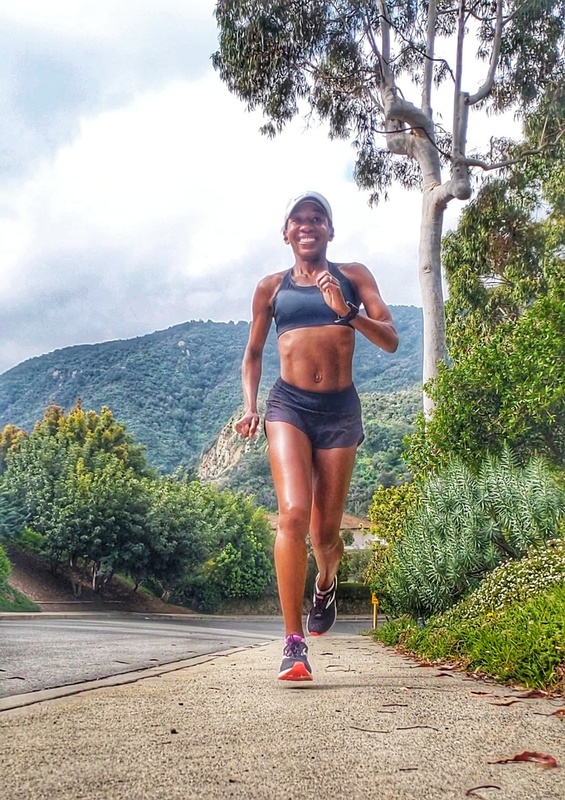 These miles aren't something I jumped into, yet it has been a guided process by my coach over years of building. I haven't begun to tap into my potential and I think that its makes you want to keep coming back for more. The plan for now is slowly building for a fast fall marathon and that work began after a nice recovery from Phoenix. I need some speed in these legs to shake things up a bit and we're working on that. Coach is keeping me challenged and I can't imagine what the marathon cycle will look like this summer. I'll share with you my training from last week. It was a solid week of work and I'm always grateful for my body - it rolls with the demands I put on it! Monday March 25th - 5 miles AM, 4.24 miles PM. Double runs are in full effect. The afternoon miles are completed at an easy pace. This run is not an extension of the morning run, yet a completely separate run with the purpose of bulking up the weekly mileage. Tuesday March 26th - 8 miles AM, 4 miles PM. Really happy to get the doubles done early in the week. Note: This is probably not happening this week as I need more rest. I've only ran one double so far this week, which means the second double will be have to be done the second half of the week. Friday March 29th - 10.25 miles and my workout happened today. 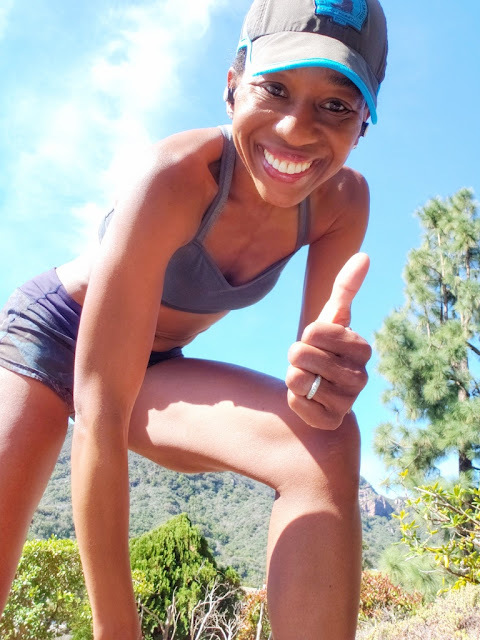 I hardly ever do a speed session on a Friday, but life happened this week and here it is! 2 mile warm up, 5 x 1 mile repeats (6:08, 6:08, 6:07, 6:07, 6:04). .25 jog in between each set and then a 2 mile cool down. These are the fastest consecutive mile repeats I have ever done. I can't wait to see the progress in the coming months! I am really happy with my effort. After the hard workout, it was time to celebrate my Mom! Gosh, I love this lovely lady and she got all the love today. It was a beautiful day, but cold in Malibu. Elle had just finished her ballet lesson and she was not a happy camper on this day, hence the face. Ah, we love you sweet girl and thanks for letting us document this moment. We went home after dinner, got cozy and warm and celebrated with a huge chocolate cake that I made. These are the special memories that make up great blocks of living. Sunday March 31st - 16 miles at 7:25 pace. I like to be completely open and straight forward here. I will not do a Friday speed session and then a Sunday long run. Ooof. That was not a good move. Do not try this at home. 73.73 miles for the week and recovery is the most important thing. Lots of sleep, hydration, nourishing foods and stretching + rolling are what I have been focused on. April is here my friends. A month of warm sunshine, green buds of new life and the fresh air of spring. I wish you happy running this week.